As early as 1832 the first portion of the Village of Clifton was laid out in streets and building lots by land owner Captain Ogden Crieghton, a British Army officer. He gave his future settlement the name “Clifton”, which derived from the town Clifton in England. Crieghton’s urban plan for Clifton had Ferry Road as a primary street. Captain Crieghton purchased the area where Clifton is from the family of Phillip Bender family. The Bender family acquired this property as part of a United Empire Loyalist land grant. This land is today is commonly referred to as “the Center”. It encompasses a major portion of the primary tourist core in Niagara Falls, Ontario. In 1833, the first Clifton Hotel was built at the base of Ferry Road (now Clifton Hill) by Harmanus Crysler and became the best hotel available. From 1834 to 1848 small rowboats was the main form of transportation for people across the Niagara River between Canada and the USA. Ferry Road was the primary route to the edge of the Niagara Gorge and the ferry service. In 1848, the first International Suspension Bridge was completed and this became the new form of travel between Canada and the USA. In 1842, Samuel Zimmerman created an estate property along the south side of Ferry Road, that he called “Clifton Place”. He planned to build a mansion to live in once it was completed. The estate of Samuel Zimmerman occupied the entire south side of Ferry Hill and was bounded by the river, Murray Hill and Ferry Road. Today this property is owned by HOCO (Harry Oakes Company). In 1856, the Village of Clifton became large enough to warrant a post office. In the same year, the Village of Clifton and the north end Village of Elgin were amalgamated to become the Town of Clifton. The only buildings in the area of “the center” on Ferry Road were the Clifton House Hotel and the Erie & Niagara Railroad Station; currently they would have been located at the bottom of the hill and top of the hill respectively. In 1898, fire destroyed the Clifton Hotel. It was replaced by the new Clifton Hotel in 1905. The first structures that Zimmerman built on his estate were four gatehouses. Each gatehouse, which was large enough to be a house, was located at each of the four entrances to the 52 acre estate. Zimmerman built a large stable for his horses and carriages. The stable was constructed of imported English yellow brick, which cost $18,000. The stables continued to exist until the mid 1950’s when the new Park Motor Hotel (Comfort Inn) complex incorporated a section of the stable wall. After the construction of the gatehouses and the stable, Zimmerman began working on plans for his mansion. He called the mansion “Clifton Place” and was estimated to cost $175,000. Samuel Zimmerman saw only the foundations of his mansion built before he was killed on March 12 1857 in the Desjardins Canal Railway accident. Following Zimmerman’s death, the estate was taken over by the Bank of Upper Canada. The Bank went bankrupt several years later and his estate was put up for sale. United States Senator John T. Bush bought Zimmerman’s estate at the price of 25 cents on the dollar. Bush bought Clifton Place and the Clifton House along with the adjoining properties. John T. Bush completed the mansion that Samuel Zimmerman imagined. The Bush mansion contained a great hall, measuring 4.9 metres wide and 27.4 metres long ran through the center of the main floor. The main floor consisted of five huge rooms and a kitchen. The second floor consisted of five larger bedrooms and the third floor consisted of a theatre (with a stage). A winding staircase (made with 1829 board metres of solid black walnut) allowed access to the various floors. The doors were 3 metres high. 300,000 kilograms of flat stone were used for the walls and hand cut limestone was used for the stone trim. The view of the Niagara Falls was available from the many windows on the upper floors, as well as the various balconies and from a little stone turret built into one wing of the mansion. To reach the turret, one had to climb out of the nearby window and walk across the roof. Originally, the mansion was heated by large fireplaces however it changed to two large furnaces. Lighting was through oil lamps, but was converted to electricity. Senator Bush and his family lived in the mansion for the next 50 years. Following his death, Miss Josephine Bush (Senator Bush’s daughter) continued to live in the mansion until 1927. In 1928, Miss Bush sold the estate to Harry Oakes. 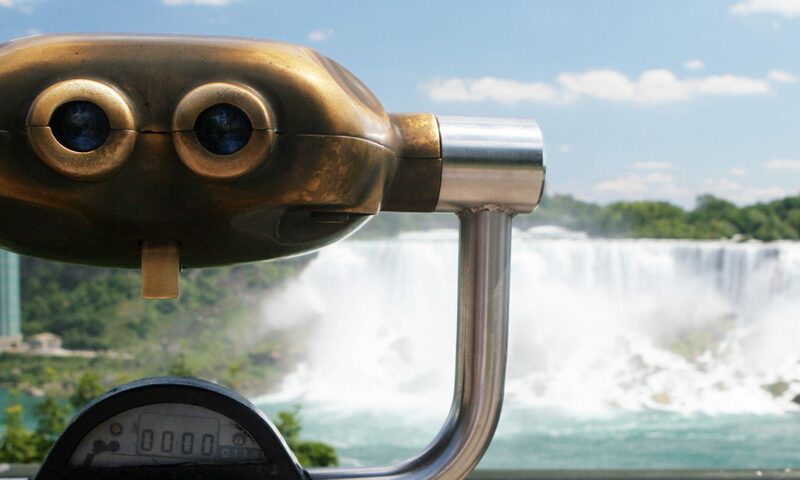 The boom of tourism in the1920’s in Niagara Falls lead to the creation of various camps and hotels on Clifton Hill. Niagara Falls Tourist Camp was opened by Charles Burland. It was located on the north side of Clifton Hill between the Foxhead Inn (currently the Sheraton on the Falls) and the Alexandra Hotel (currently the Comfort Inn). Earl McIntosh opened two campgrounds; the Clifton Touring Camp and the Clifton Camp. The Clifton Touring Camp was located on the south side of Clifton Hill (currently the Comfort Inn). McIntosh also opened his Clifton Camp located on the north side of Clifton Hill. In 1925, Howard Fox opened his famous Foxhead Inn on the corner of Clifton Hill and Falls Avenue. The Inn was a subsidiary of the Clifton Hotel and was located on the current site of the Sheraton on the Falls Hotel. Reinhart’s Riverhurst Inn was located on the north side of Clifton Hill between the Niagara Falls Tourist Camp and the Foxhead Inn. For several years after Welland Securities (Harry Oakes) purchased the Bush estate, two of the gatehouses were used as private residences. In 1937, Welland Securities began using the Clifton Gate House as their general office. As the years passed, the Clifton Gate House was utilized as an antique gun museum and then became a souvenir store. The mansion was left vacant for 10 years until Harry Oakes announced it would be torn down. Despite a public outcry to preserve the mansion, it was completely demolished by June 1 1937. Of the four gatehouses, the Queen Victoria Park house and Robinson Street house were the first to be removed. By 1937, only two gatehouses and the stable remained standing, but by the 1950’s, The Victoria Avenue gatehouse was demolished. In the late 1950’s, the Park Motor Hotel (currently the Comfort Inn) and the Fallsway Hotel (currently the Quality Inn) were build on a large portion of the former Bush estate. Harry Oakes owned the Park Motor Hotel, but the Fallsway Motel was separately owned until Harry Oakes bought it. Both hotels continue in operation today. In November of 1965, the Clifton Gate House was demolished to make way for a two storey building (today known as the Hollywood Wax Museum) worth $170,000. Clifton Hill has continued to evolve and has been transformed into the hub of the tourist district, second only to the Falls. Clifton Hill Tourist District is the heart of tourist entertainment at Niagara Falls.